Brickwork is common building work. In which bricks are used for construction work. Note that upto 2 story bricks can be used as a load bearing structure. Standard size of brick is 190x90x90 mm. 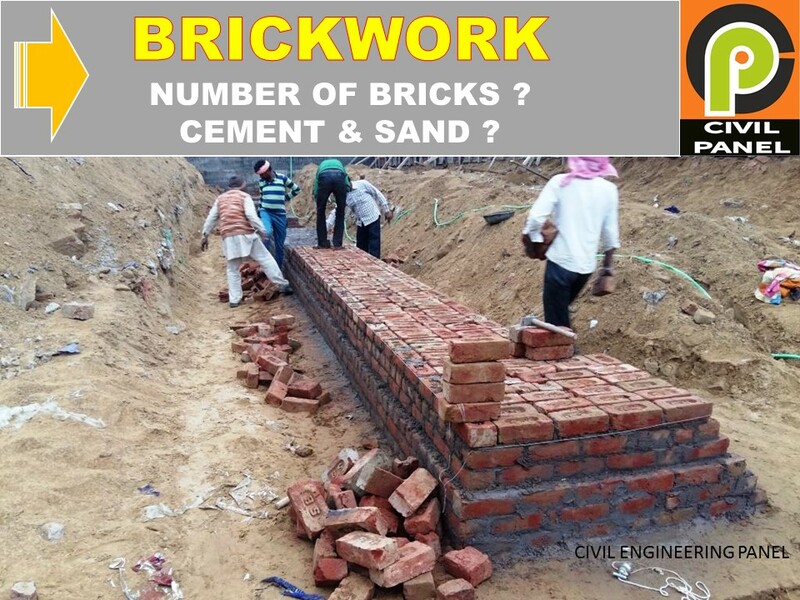 Nominal size of bricks are 200x100x100 mm, which is included the 10mm of mortar all around. But in the practical life, most common size used at site in India is generally 9″x4.5″x3″ inches. A Brick should not absorb the 20% water in water absorption test conducted for 24 hours. A brick should not have any efflorescence effect. Irregular shape or Zhamma bricks are neglected. Brickwork is measured in cubic metres or cubic feet. The length, breadth and height is multiplied to calculate the total quantity used for any construction whether it is wall, pedestal or slab. Note that: In government tenders the brickwork also measured in area, because it is assumed that the depth or width is fixed for any construction. Half brick masonry in foundation & plinth using bricks of designation 75 with nominal hoop rainforsed (2 Nos. 6mm MS bar) at every fourth course in for hoop rainforcement 1Sqm. 6mm MS bar 2x2x1.00 = 4.00 Cement mortar 1:6 (1Cement:6-coarse sand).Add extra over item No. 5.8 for half brick masonary in superstructure up to third story. The above item is measured in square metre and its price is 458.00 rupees per square metres. Now we have our quantity of brickwork, so we can easily find out the actual bricks required for construction. In this first we calculate the quantity required for standard size brickwork and after that same calculation for actual field size bricks. Now Calculation of mortar ? Here we does not add mortar along length of brick because generally nowadays 9″ inches wall is considered and outer face is calculated as plaster area. You can add mortar if width of wall is more than 1 brick. Actual number varies from meson to meson because some one use less mortar and some one use more mortar. so it is mainly 390 to 430. Generally local contractor consider 420 bricks in 1 cubic metre.